Add a background to your MicroWorld EX programs to take your games to a more visually appealing realm. If you create a UFO Pilot game your background would conveys a space theme. A great way to do this is to paste actual space and planet photos on your game background. In any web browser, navigate to the website of your favorite search engine. Search for space images to locate a background you like. 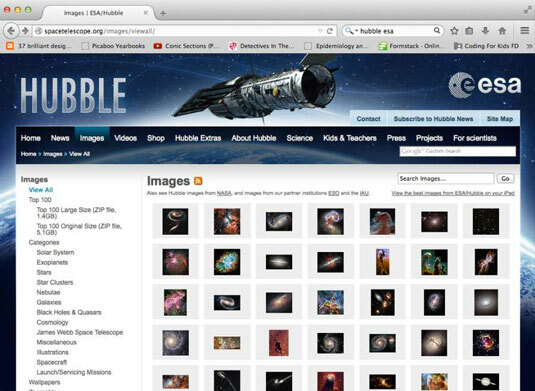 One great source is the images category of the Hubble Space Telescope site. Go to the Images menu in the top-left corner and click any thumbnail image to open a full-size version of the image. Click the background image you want to apply to your game, and then click in the workspace to apply the background image. Right-click (Windows) or Ctrl-click (Mac) the background image and select Stamp Full Page. The image is stamped to fill the entire workspace. Copy a space background you like on the website by right-clicking (Windows) or Ctrl-clicking (Mac) the image and selecting Copy Image from the pop-up menu. Move to the MicroWorlds EX workspace and paste the background by right-clicking (Windows) or Ctrl-clicking (Mac) the image and selecting Paste from the pop-up menu. Right-click (Windows) or Ctrl-click (Mac) the pasted background image. From the pop-up menu, select Stamp or Stamp Full Page. The image is stamped to fill the entire workspace. Return to the space images in your browser page. Now locate a moon or planet you like, for example in the Solar System category. 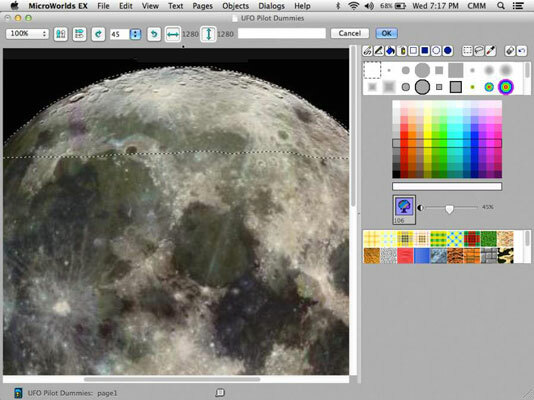 Right-click (Windows) or Ctrl-click (Mac) the moon or planet image and select Copy Image from the pop-up menu. Return to MicroWorlds EX and click the project Shapes tab in the bottom-right corner to open the Shape pane. Right-click (Windows) or Ctrl-click (Mac) a shape spot and select Paste from the pop-up menu. The moon or planet image is pasted into the shape spot like in the example. Double-click the shape spot where you pasted the moon or planet. Decrease the Zoom percentage, in the top-right corner, to view as much of the moon or planet as possible. Select the Lasso tool in the Shape Editor. Click and hold down the mouse button as you drag to select a small wedge at the top of the moon or planet. Release the mouse button when you finish enclosing the wedge. Choose Edit→Copy from the menu bar. Click OK to close the Shape Editor. Right-click (Windows) or Ctrl-click (Mac) an empty shape spot and select Paste from the pop-up menu. The wedge now occupies a shape spot. Click the wedge at the shape spot and then move into the workspace and click the background. The wedge appears on the background. Drag the wedge near the bottom of the workspace. Pull the sizing dots to resize the wedge as needed. Right-click (Windows) or Ctrl-click (Mac) the wedge and select Stamp from the pop-up menu. On the toolbar, click the Hide/Show Painting/Clipart button. 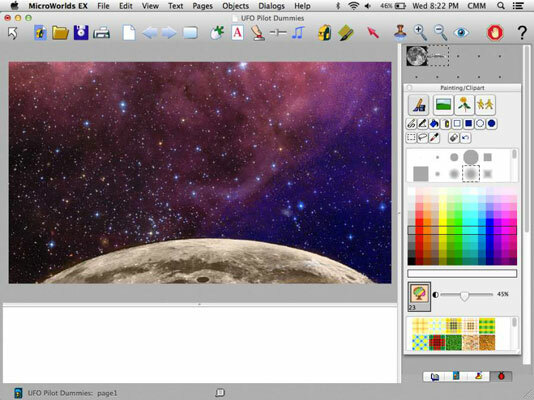 Use the Painting Tools area of the palette to add additional colors or make modifications to your space background.